AS well as promising to tone and firm your skin, this amazing serum has ingredients that can even help you beat depression. Packed full of frankincense – a natural mood booster – Angela Langford’s Little Lift Serum can help fight stress and negative emotions as well as helping to boost the immune system. Massage this into the face for plump, glowing and dramatically tighter skin within weeks. This feels silky and non-greasy and can be used alone or under moisturiser for younger-looking skin. Frankincense oil not only helps you beat the blues, but it also fights against infections and germs, meaning less chance of pimples too. If you suffer from hormonal breakouts, this serum can balance out hormone levels and stop those pesky plooks from popping up too. Skin feels calm and nourish after application and the therapeutic ingredients will help you enjoy the best sleep. Oh Yeahh is the first lip balm which claims to make you feel happier in one slick. Containing delicious-tasting kiwi extract and cocoa butter, this also helps to raise serotonin levels thanks to naturally occurring tryptophan-rich ingredients. Pretty in pink, Happiness Lip Balm gives your lips a delicate shimmer and elegant, just-bitten look. It also contains SPF15 so is perfect for packing in your travel bag. 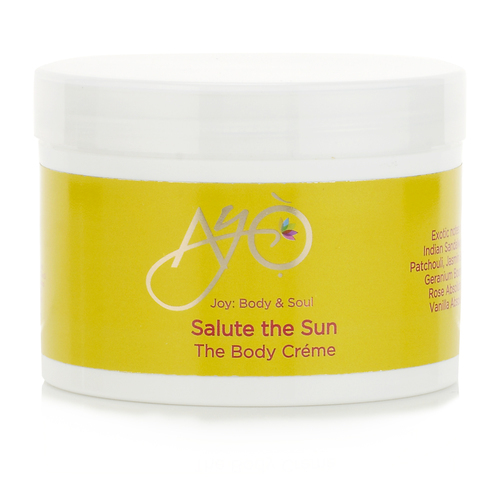 Championed by Bond star Thandie Newton, Ayo Beauty uses products which naturally boost endorphins. Containing lavish ingredients such as Cacao Butter and rich Chia Oil and Vitamin E, this body creme nourishes and revitalises the skin as well as leaving it silky smooth. This is a luxury body creme designed to make you feel pampered and well. Apply after a hot lavender bath at night to have the best night’s sleep and wake up feeling rejuvenated. THIS award-winning pillow spray will help you wake up feeling dreamily refreshed. Containing a natural superblend of lavender, vetivert and chamomile, this is infused with ingredients to help calm both mind and body, soothing you to sleep. Eight hours of kip can help you wake up feeling in a great mood and ready to face the day. When we sleep our skin cells repair and harmful toxins are removed, making sleep the ultimate beauty secret.